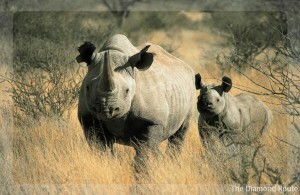 What is it about rhino horn? When something strikes you as utterly irrational such as the East’s preoccupation with rhino horn it’s worth trying to understand it. Rhino, having been around for millions of years, have become symbols of strength for humans. Owing to their size and their protective horn (used as a defensive weapon) adult rhino were pretty much invulnerable to predation in the past. It is this mystique of invincibility that is so coveted now – first as a cure for ailments (in the absence of modern pharmaceuticals) and now as proof of having reached a certain level of affluence. Having recently emerged from an agrarian society where the wealthy were few and far between many Vietnamese feel empowered by their newly acquired prosperity. Possessing a rhino horn, and displaying it in their homes and offices, is a natural expression of this achievement. But what if a owning a rhino horn represented a hollow promise? What if things have changed and rhino are actually so vulnerable they are in danger of collapse and extinction? Would you want to crow your success by associating with rhino, a species that is weak and powerless, far from invincible? Humans learn quickly (it’s one of the reasons our species has been so successful) so when the Vietnamese start realising just what mantle they are cloaking themselves with by identifying with rhino horn I predict there will be a sudden drop in its desirability. Portraying rhino as the defenceless creatures they now are will help to speed up this change. Postscript – Of course the phallic-like quality of the horn isn’t helpful in this depiction and it may be that hornless rhino are the way to go.